Current GameCola superfan No Lynch submitted today's review of Rhythm Heaven! This is a fan review by GameCola fan No Lynch. Want to submit a guest piece to GameCola.net? Send a review, a top-10 list, a random opinion piece, photography, artwork, a letter to the editor, fanfiction, or just about anything else to ajedraszczak@gamecola.net , and we just might make you Internet-famous. Everyone has their own specific taste in videogames. Some love the control-based action that platformers provide, while others prefer the strategy and sense of victory of a turn-based RPG. There are even some people who only play games where you walk around in first-person shooting people dead. But personally, I love rhythm games. Rhythm games are, basically put, videogames that test your sense of rhythm. I’ve learned recently that there are actually a lot more rhythm games out there than I thought. But, in case you’re one of the people who isn’t aware, these games come in many different variants besides the popular DDR and Instrument Hero. My personal favorite of the bunch is Rhythm Heaven for the Nintendo DS. There it is. The box art in all its glory. 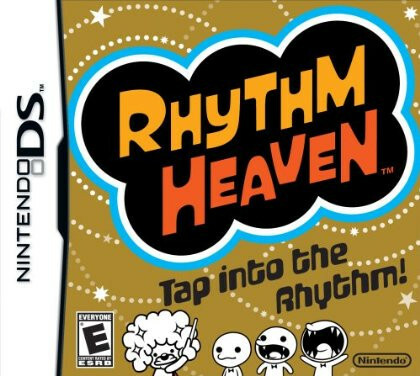 Rhythm Heaven, known as Rhythm Paradise in Europe and Rhythm Tengoku Gold in Japan, was produced by Nintendo SPD Software Development Group No. 1 (also known for the WarioWare series) in collaboration with musical artist Tsunku, as a sequel to the GBA Japan-only game, Rhythm Tengoku, which they both also worked on. In case you’ve never played a Rhythm Heaven game, here’s how they work: After you start it up, you play a reasonably short rhythm minigame. Then, you unlock and play another. And then one after—so on and so forth. After playing four, you play a “remix”, which takes the previous four minigames and mixes them all together, switching from one to the other at the drop of a hat. I don’t know who kept dropping hats so often that we made an idiom from it, but that’s the way things are. It’s also completely unrelated to Rhythm Heaven. Gameplay: At its most basic, how well the game plays. This includes the controls, menu navigation, difficulty, and progression. Music: The most important part of a music game is, of course, the music. How does the music sound? Is it catchy, is it tedious? Do they create new tunes for each stage or just remix the same one over and over again? Extras: I put into this category what the game rewards you with for doing well, besides a “Great!” or an A ranking. Bonus stuff, like concept art or supplementary information. Satisfaction: This is the most important thing for a gamer to feel after playing. How satisfied are you when you finally 100% that thing? (?) Story: This sixth one may be called upon whenever it applies. When it does, it would be listed first. It does not apply in the case of Rhythm Heaven. By these standards, first, we take a look at the Gameplay. You play with the DS on its side, using the touchscreen to navigate through menus and select the rhythm minigame you want to play. You proceed through a total of 50 minigames, including remixes, with the final four sets being sequels and remixes of more than just four songs. To play one of the games, you tap and flick on the touchscreen to the cues provided by the music. Depending on how well you stay with the rhythm, you can receive a ranking of either “Superb”, “OK”, or simply “Try Again”—all of which come with a little humorous image and caption. Your first superb on a stage earns you a medal, the value of which will be discussed during Extras. But, if there’s just that ONE game where you can’t quite hit the cue right, or you just want to take a break, you can head to the Café. A little extra area, the Café is something I’ll talk about just a little later, but I’m bringing it up now because, if you just can’t even get an “OK” on that one rhythm game three times in a row, the Barista offers to let you skip it and move on to the next rhythm game. So, that’s convenient if you can’t quite get into a level’s groove. While the levels aren’t that hard to get down if you’re vaguely good with a sense of rhythm, there will be a couple of them that will get you stuck for a while. If you want to skip them and move on to others that you might find more enjoyable, you can go right ahead. All in all, the gameplay challenge is pretty much fair and even all around, with extra challenges here and there. Basically, once you get down the controls, if your rhythm is up to the beat, you should be pretty much OK in terms of progressing through the game. The only gameplay aspect I don’t understand is the Flow count. It doesn’t actually affect the game, but it supposedly keeps track of how well you’re keeping with the rhythm. Of course, in a game about music, what’s really important is the Music. As mentioned above, the overall game is comprised of 50 unique, individual minigames, not including the games in the Extras. For each minigame is a new, unique song—and the soundtrack is really to be admired. They’re all very catchy, lovable songs, and chances are you’ll be humming at least one of them while walking down the street after playing. The English translated lyrics for the five songs that have them are a bit cheesy, but they’re still very fun songs. Every single menu also has a fun song to it, so it’s worth listening to ’em a while before moving on through the game. On an unrelated side note, love seems to be a recurring theme throughout the minigames. It is, if not directly mentioned, heavily implied in the lyrics of all five songs that have them, and made very obvious in the minigames Love Lizards and Love Lab, where they are experimenting with the science of love—which seems like a very bad idea to me, but we’ve gotten too off-topic already. This is just another day for a Rhythm Heaven fan. But, why? Why, when playing this game, should you strive to get every single medal and perfect? That, my friends, would be the Extras. On the main menu of the game, at the bottom of the screen (the middle after you’ve beaten the first three sets), there are two buttons. One of them leads to the Medal Corner, which rewards you for receiving medals, and the Café, which holds the rewards for obtaining Perfects. Starting with the former, it holds Rhythm Toys, which are just pointless little games which serve absolutely no purpose whatsoever with the exception of Phone’s easter eggs. There are also Endless Games, which are—true to their name—rhythm games that can go on forever, provided you don’t mess up too badly. Each toy or game unlocks when you have a certain amount of medals. The more medals required to unlock, the more complex the game/toy. The game developers must have really liked the Rockers minigame they had in the base 50, because after you beat it, the medals you collect go to unlock “guitar lessons” for playing other songs with the Rockers gameplay style. After beating Rockers 2, more lessons using the new trick the sequel taught you are unlocked. You use these skills to compete in the Battle of the Bands, a test of all you learned from the “Headbang King”, which you can enter after passing all the lessons for that course. Aside from the fun add-ons, the more satisfying extras, to me, are in the Café. Basically, this is a feature meant to provide a bit of relaxation. When you go in, you can talk to the Barista, who never actually appears on screen, but is still a fun character to hear from. 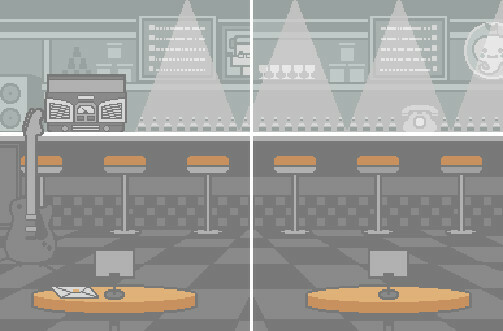 Aside from skipping stages, the Café holds the ability to play the music featured in the game, and also access supplementary text which, in most cases, explains more about what is happening in the otherwise nonsensical events of the minigames. You unlock each song and text by achieving a Perfect on the corresponding game, rewarding you for being rhythmically inclined. There’s also the ability to replay the flick control tutorial you get when you first start playing, but if you’ve gotten it down there’s really no point. The Café in question. Rather nice, actually. In conclusion, I’d have to say my Satisfaction level for this game is extremely high. The songs are all excellent, the gameplay is very fun, and, even though I did have to fight with it for a while, the feeling of triumph after finally getting that 50th perfect is a feeling that just about couldn’t be beat. While acknowledging that Rhythm Heaven does have it’s faults, and that it’s not for all players, I’d be willing to give this game as high a score as possible while taking those into consideration.